Can’t you smell the waft of deep-fried butter in the air? It’s festival season, and there’s nothing better than enjoying some summer fun with your family – if you all can keep it together that long. Follow this festival survival guide and your family should stay comfortable, healthy and more importantly, sane. Whatever you’re wearing, let it breathe. Leslee Hill, a mother of two and president of the image consulting firm Hill Image, which provides consultation on wardrobe styling and personal shopping, says natural fibers, like cotton, keeps everyone cool and prevents chafing. Clothing made with wicking materials that pull moisture away from the skin is also a great alternative for both children and adults. "Definitely try to wear a T-shirt with some sort of a cap sleeve at least, because the sun beats down directly on your shoulders, and that should help with the sunburn," Hill says. "And then, try breathable hats. Fedoras are big, and if they are straw, they still allow for ventilation." For kids who aren’t fans of hats, Hill suggests a visor. If the visor is a no-go, pull out a small umbrella to block out some sun. Ultimately, Hill believes that shoes will make or break you. Avoid sandals with no support, unless you like the feeling of walking barefoot on hard concrete, and sneakers are the way to go for kids who find mysterious ways to trip over themselves or lose a flip-flop. Emily Fitzgerald, a mother of two and founder of OLS Organizing, says preparing yourself in advance, even if it’s just applying sunscreen before you leave, could work in your favor. "I think the most important thing is sunblocking, because you’ll regret your fun the next day or the kids will be so uncomfortable that they won’t enjoy their time," she says. "And sunscreen is one of those things where they say apply it 30 minutes early and sometimes it’s just easier to get it on while you’re in the house rather than when you get there." 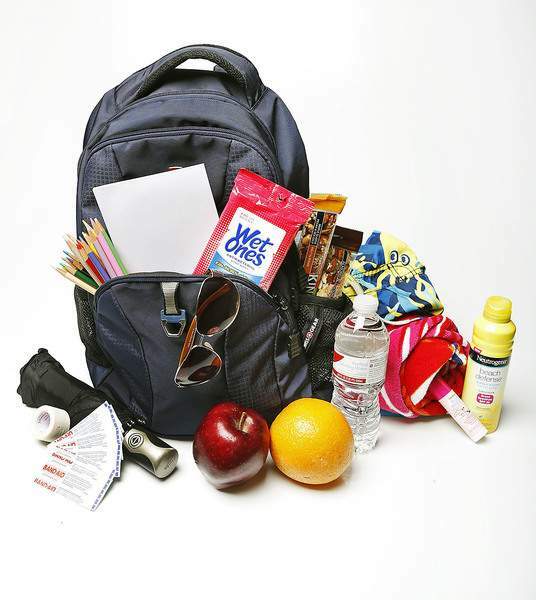 Fitzgerald says to bring the sunscreen along in the family’s designated festival bag, and make sure the bag is stocked throughout the season with essentials that are light enough to carry around and not susceptible to melting. Keep an inventory of what you need and what’s getting low with an index card you tuck in the bag. And if you’re looking to stay on budget, Fitzgerald says to bring cash. Not only do you avoid those ATM lines and fees, but cash serves as a great visual aid of how much you are willing to spend. Be clear with each child that he or she has a certain amount of money allotted for rides, prizes and food, and help them set their priorities. It’s a valuable lesson that also keeps your wallet happy. You can still have the funnel cake or elephant ear, but pre-game with something healthy. Having a healthy snack before the junk food curbs the ultimate sugar rush for the kids, while adults can save their waistlines with less sugary calories. Fitzgerald says she likes to pack snacks that can stand up to the festival heat, like nuts, granola bars and ripe fruit, but snacks like string cheese can be stored in insulated containers to keep them cool. You could also re-use containers or Ziploc bags for festival food leftovers. If you want to completely avoid the deep-fried fare, however, Hill says to pick out lighter treats that are just as sweet. "I have no problem doing something like ice cream or frozen yogurt, but I don’t want them to have the fried Snickers, especially when they are under 10 (years old)," she says. "Personally, I feel like those kind of things are things adults don’t even need to eat. But with kids, if you start giving it to them too early, that may be all they’ll want."